Cancelled! 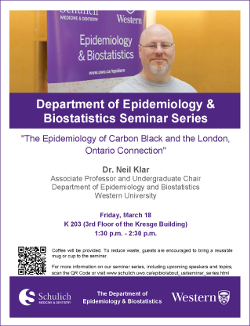 Dr. Neil Klar, "The Epidemiology of Carbon Black and the London, Ontario Connection"
Please note that this event is cancelled. "The Epidemiology of Carbon Black and the London, Ontario Connection"